I was really excited when I heard that the Mullet had finally come back into Weymouth Harbour, after what seems to me to be the longest winter I can remember. I had a trip down to the harbour on Sunday and I can tell you the Mullet were around in large numbers. I spotted at least 200, in numerous shoals. Some of the fish looked like they were well in excess of 5lb. Although I tried to catch them on lite LRF gear on Sunday, I struggled to land any of the 7 I hooked. At first I thought it was due to ultra lite rod I was using, then when I thought about it I realised I was not able to give the fish enough pressure for fear of breaking the 2lb fluro carbon line I had been using for LRF fishing. After doubling my Fluro Carbon line to 4lb, I set of again to try and land a Mullet on LRF gear. There is no real need to go so lite, but I fancied the challenge. 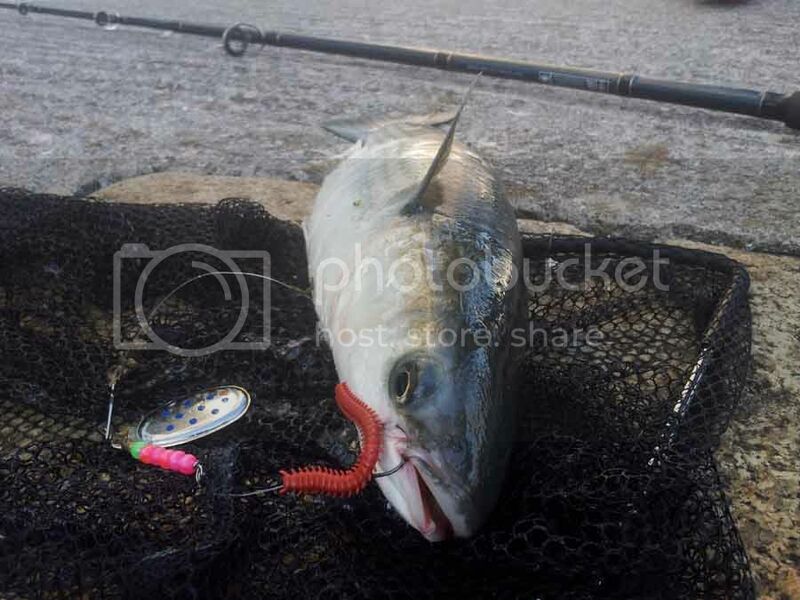 My Rod was a Tronix Pro Rockfish UL, rated at 0.5 – 7g and I was using a Mepp’s type spinner, modified for Mullet fishing. A lot of people think that Mullet are one of the most difficult fish to catch, but I don’t agree. especially when it comes to Thin Lipped Mullet. They will readily take a Mepp’s spinner, baited with a bit of Ragworm,or Power isome if it is presented properly. If you get it wrong you could cast all day and get nothing. So I am going to give you a step by step guide on how to rig up a Mepp for Mullet. You can use a traditional Mepp or one of the more modern Mullet spinners that uses a short section of wire to hold the hook off. 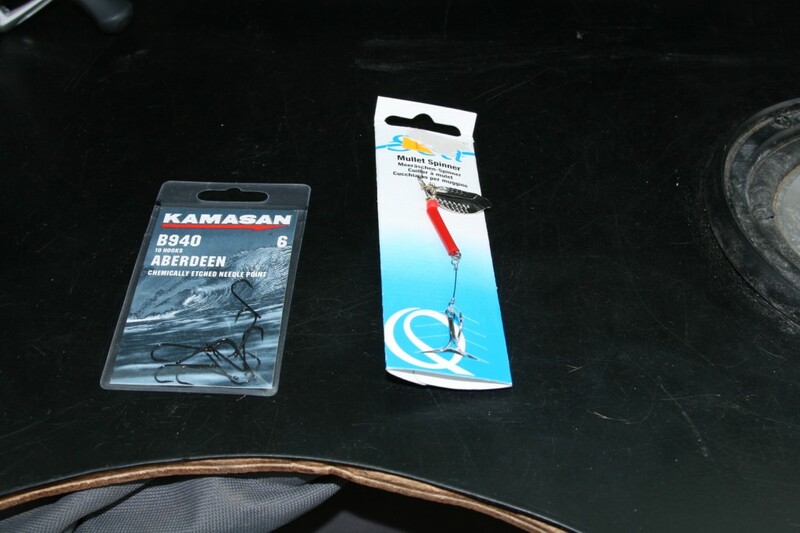 As you can see from the picture below, they come with a treble hook. The first thing you need to do is change the treble for a single size 6 hook on a short length of fluro carbon. I like to make the hook length about 2 inches. Any shorter and they shy away, any longer and the number of hook ups decreases substantially. The finished lure. 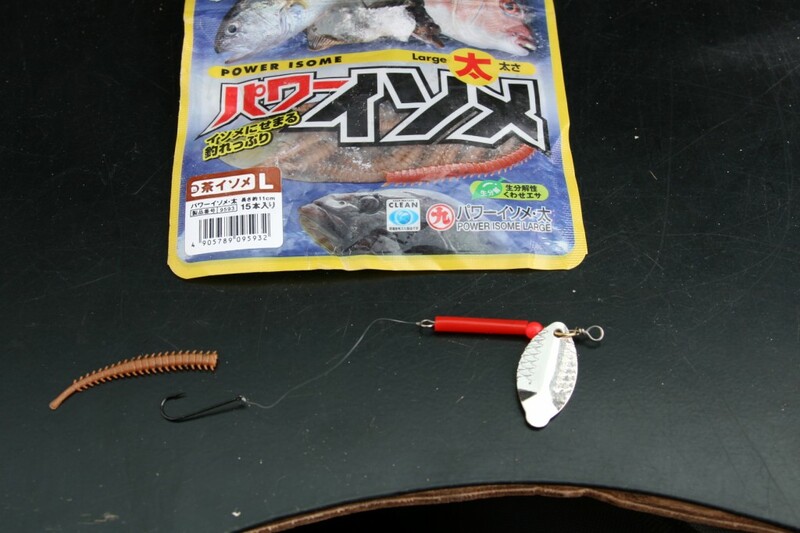 In this case I have used large Power Isome instead of a Ragworm to tip the end of the lure. Power Isome has advantages and disadvantages over live Ragworm. There are one or two rules that you need to follow that make the difference between catching quite a few fish and catching none or very few. Firstly and probably the most important is to make sure that the worm or Power Isome is rigged so that it is completely straight. So that when you retrieve the lure it comes back with the worm trailing straight behind it. If it is kinked or not straight the worm spins or rolls in a slow loop, that puts the Mullet off. This is where the Power Isome has a great advantage, as it is easy to keep straight and doesn’t often slip round the bend of the hook, even after the fish have mouthed it. The downside to Power Isome is once the fish have mouthed it they don’t like the taste of it and drop it pretty quickly. This results in a lot less hook ups but far more follows. Once you have spotted a shoal of Mullet you have to cast from behind them. 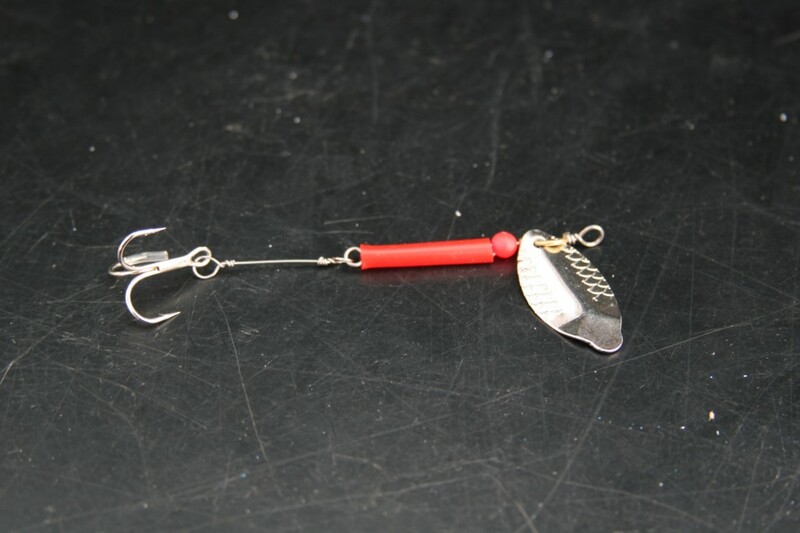 Cast the lure and get the blade of the Mepp to start spinning as soon as you can get it to, other wise it drops to deeply and often comes up through the shoal and spooks them. A nice steady retrieve works best. Try not to spook the shoal, I know that can be hard. 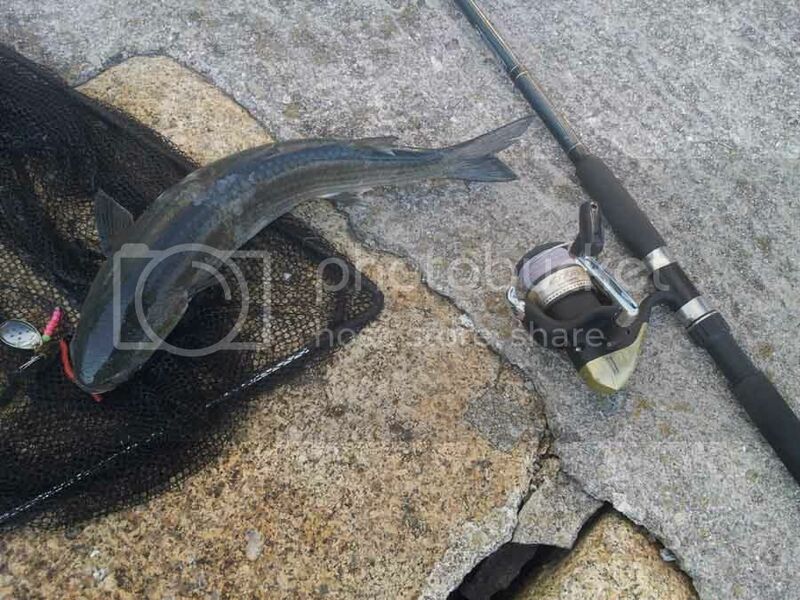 What normally happens is one or more Mullet will spot the lure and detach from the shoal and chase the lure. keep your cool and just keep retrieving at the same pace. They tend to mouth there way up the worm until the feel the hook then turn away, resulting in them hooking themselves. Make sure you have a landing net and enjoy the fun of playing a powerful fish. I have included a short and very badly edited video of me catching some yesterday. I will do a full video piece on Mullet fishing next week. I hope. 13 Responses to "Lure fishing for Thin Lipped Mullet"
Loved the way in which you presented the hook up in slow motion. Where can I get a good light slow moving spinner and also this Power Enzime that you have revealed to me. I am fixing to get down to magnificent Weymouth soon. I currently live in essex.Give me Dorset any day. P.S in your experience which fight harder..The thin lipped or thick lipped mullett? Also as I am recovering from an illness it will be difficult for me to access the more remoth fishing areas. Can Bass and gilt head bream be caught in the town harbour. You can get a Mepp’s spinner in just about any fishing tackle shop, as they are one of the more traditional spinners. The Power Isome can be bought from either Chesil Bait n Tackle or Weymouth Angling Centre in Weymouth, or online from the same shops and Art of Fishing. Thick Lipped Mullet fight far harder than Thin Lipped Mullet. You do get some Bass in Weymouth Harbour but no Gilthead Bream. Thanks – fantastic, educational article. Much appreciated. 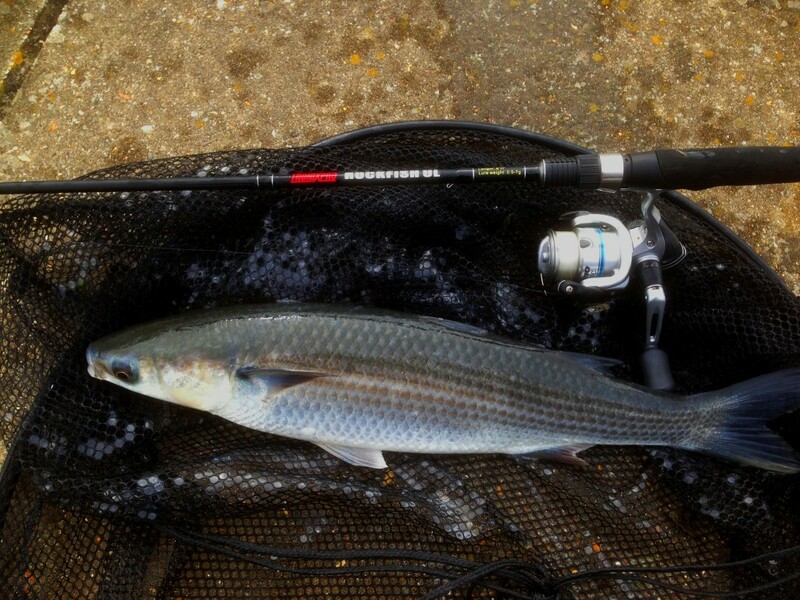 The THin Lipped Mullet normally move in to the harbour around mid to late March. THey arrive in the hundreds, before moving up into Radipole lake and dispersing. Unfortunately the council have put railings up at the part I used to fish, so it is much more difficult to fish there now. Hi , great blog .. was hoping to try for a thin lipped in the river camel (Cornwall) and have just got myself a few mepps to use , I was wandering I should use a drilled lead a foot or so in front of the spinner to gain a bit more distance in the cast ? No, don’t use anything on lures as it makes them change the way they work. It will drive the Mepp down too far, so you will have to compensate by retrieving it too quickly. 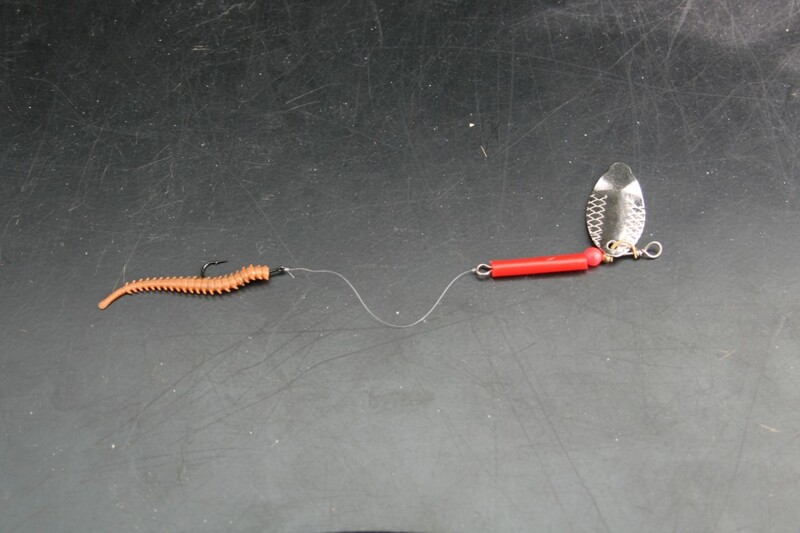 Use as light a rod as possible, to give you maximum distance with a light lure like a Mepp. I can’t wait to try this, especially since it appears to be the answer to my problem without having even tried it. I’m in Florida in the USA where the rivers empty into the ocean, and mullet come into our rivers like salmon in an Alaska creek! NOBODY knows how to catch them though! I know 1 old timer who says he used to catch them on the baited spinner but he never said anything about these modifications. I’ve caught 6 in my entire life with an unmodified spinner, so while the spinner proved to work, surely there was something more that I was missing and this is probably it. I can’t wait to try it!!!!!! These fish are yummy by the way!!!!!! I wish you all the luck Justin. Let me know if it works. I got the same mixed results but atleast I got some results. I hung 1 and some others followed it. I’ve since went over it with a few people and decided that the problem is where I’m fishing, which is in the grass where the most mullet are, and that the place with the most fish isn’t necessarily the best bet in this rare case. The in the grass in the 6 pr 8 inches of water between it and the surface. They spook easy and if you actually manage a throw without spooking them then you just get hung up. The few mullet I’ve caught, and that others have told me they caught, were where the mullet were down deeper near rocks. Obviously you could fish them without spooking them or getting hung in grass. So that’s the next concept to concentrate on.